Opposites attract but don’t get along. Can a dusty box of old love letters change everything? 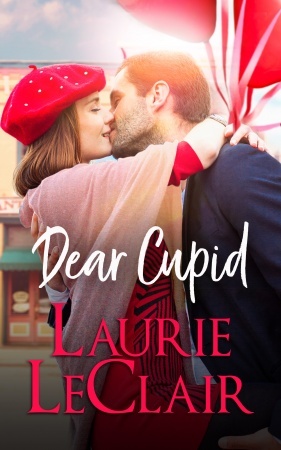 Sensible librarian Gemma Valentine helps close her family’s antique store and enjoy Cupid’s Corners’ Valentine’s Day festival celebrating romance and weddings—even if she doesn’t believe in love. But when she’s tricked into briefly reviving the town paper’s Dear Cupid advice column, with her best friend’s too handsome brother as part of the deal, she’s miffed. Why does he have to disturb her nice, tidy life? Architect and hometown football hero Sean McCleary’s promotion hinges on renovating Gemma’s building into a sleek, trendy retail space fast. He’s willing to do anything to finish this project even provide a man’s perspective for the lovelorn column. Why not? Gemma might be annoying, but she’s funny and adorable and he enjoys their spirited banter. Soon Sean sees Gemma in a new light and wonders if he can convince her to give him a chance. Can two Cupid columnists take their own advice on falling in love? The chilly January morning seeped into Gemma Valentine’s bones. Her brisk walk from her car at the town square hadn’t outpaced the swirl of gusty winds at her feet. Reaching up with her gloved hands, she tugged the red knit scarf her gram had made her a little tighter and then smoothed down the fringed ends tickling her chin. If only they made nose warmers. Hers was turning cold fast. Standing on the quiet faded red-brick sidewalk, she tilted her head up to gaze at her family’s antique shop. Valentine’s At Vine beckoned in gold letters against the dark green painted wood and above the tall, large windows. The store had been the cornerstone of this block of buildings for six decades. In her mind, closing the declining business in four short weeks proved necessary and practicable. Yep, one thing I am is sensible. Although a teensy tiny part of her heart pinged at the thought of never ever returning here again. It was her home away from home growing up in Cupid’s Corner. Her grandparents had made a little nook just for her and her array of favorite books—and assortment of dolls and stuffed animals—to entertain herself to her heart’s content. And later, she and her friends worked part time here dusting, sorting, ringing up sales, and sweeping to earn extra money for the movies or a new dress for a high school dance. Even her best friend Molly’s annoying, handsome, and near-perfect older brother Sean pitched in with the moving and lifting the heavy stuff every summer to pay for his football camp gear. But she swept away the sudden, unexpected, and unwanted wave of sweet memories at her family’s shop. It had to be done. The closing, as they called it. Gemma yearned to give her grandparents their much-deserved safe, secure golden retirement years. They were far too generous by not raising the rent in the last decade on businesses leased in the block of buildings they’d owned. Add that to the increasing repairs, sky-rocketing insurance premiums they shouldered, and everything else with hefty prices and they were dipping deep into cash reserves they couldn’t afford. Next, it would be their retirement nest egg. It was time to save them. Again. Her belly ached at how much it reminded her of when she was growing up and finding out they were in dire straits. At twelve, she’d come upon her gram crying over the pile of mounting, overdue bills. Her grandparents and parents were wonderful, creative, and outgoing. However, that day she’d been hit with the cold, hard reality that they didn’t know the business end and they could lose everything. Fear had risen, her chest tightening, and it had been all she could do to breathe. With no other option, Gemma had offered her college fund. She’d planned on going to her favorite college and living on campus like all the other students. She never did. Instead, she stayed at home, worked through high school and beyond, changed her major, attended community college, and paid her way—with as much help as her family could provide when she transferred to a local university to finish her degree. At least they’d all get one last Valentine’s Day festivities—her family’s favorite holiday—in before they’d shuttered the store for good. She clutched the new planning notebook in her left arm. It was all there in black and white, each step down to the very last detail they had to take until the final moment. How could she get her parents on board when they’d been busy with redoing their huge detached garage and then moving their furniture salvage, refurbishing, and upholstery shop there? They’d been against selling the property—even the alternative of splitting up the block of buildings—but had little know-how to turn slumping sales around. People weren’t buying antiques like they used to. A sad and true fact. It had taken months of reality to set in for her family. She, on the other hand, had known much longer. Numbers didn’t lie, even if she wanted them to. So, Gemma had presented the evidence and slowly convinced them all it was time to let go. Her grandparents’ future depended on this. No hitches or hiccups allowed. They didn’t have to retire fully, just not stay here so they were pouring in more money than they were making the last year. Overhead, utilities, taxes, oh my! A crisp breeze picked up, whipping the fringe on her scarf enough to brush along her left cheek and shift her precariously positioned hat. Gemma reached up and straightened her matching red knit cap. Suddenly, she noted a movement in one of the large, wide windows to her right. A beautifully dressed mannequin in classic Gibson girl attire—long white gown and her hair swept up in the famous style—swayed. “Nope. That was her hand. And it’s loose!” Gemma giggled as it seemingly moved on its own. Looking closer, she noted her petite, spry gram—short in stature, but strong in every other way—behind the figure, attempting to adjust it. But the arm, from the elbow to the fingertips, moved up and down as if waving to her. Her grandmother peeked out and grinned. Gram pointed the hand—index finger slightly raised—and then marched away. Gemma shook her head and then rushed up the stone steps, opening the door at the same time her gram did. The cheerful tinkling bell overhead made Gemma smile just as it always did. Warmth stole over Gemma. The inviting hot-chocolate scent welcomed her as she stepped over the threshold and quickly closed the door to stop the cold air from rushing in behind her. “Would you like a hand, dear?” Gram held out the strange bisque-colored appendage. “How can you even ask that with a straight face?” Gemma chuckled. She got a big squeeze in return and something thumped her on her back a few times. The hand! “How about a pat on the back?” Gram giggled in her ear. It was the sweetest sound. The cozy warmth of the shop seeped into Gemma, chasing away the winter outdoor chill. The scent of a burning cherry candle drifted to her now, making it feel more inviting. “Hmmm… Did you say hot chocolate?” Diverting her eager grandmother seemed best at the moment. “Don’t think I don’t know what you just did, dear.” She smirked. “Coming right up.” Gram went to the sidebar where she had an array of coffees, teas, and her even larger hot chocolate dispenser. Two plates of nearby cookies—sugar and iced lemon—were piled high. Setting down her notebook and black crossbody messenger bag on the worn wooden checkout counter, Gemma shucked off her hat, scarf, and coat and then hung them on the nearby coat stand. “Is Gramps here? I wanted to go over the schedule.” Maybe if she could get them to see this in black and white it would give them the sense of urgency she dealt with. There was a lot of work to do and only four weeks to do it in. Her gaze wandered past the quaint antique furniture groupings as if they’d been taken from a different century and plopped down here, along with crystal chandeliers, displays of gorgeous, multicolor and multi-designed quilts on special racks, the rows and rows of tall shelves stuffed with knickknacks and bric-a-brac to the little cubbies of specialty items—clothes, collectibles, and toys—and down the long length of the shop to the back where noises came from. Her soft blue eyes sparkled and her cheeks brightened with a hint of pink. Something tugged in Gemma’s chest. What her grandparents found was very rare indeed. “I will be forever grateful. Library sciences are forever grateful.” She loved working at the small library less than a half hour away. So, who needed to be that globe-trotting journalist she dreamed of as a kid with her best friend, Molly, as her photographer sidekick? “Maybe after this school year ends, if there’s an opening, I can look into it.” She’d love to be here close to her family, but there were so few positions at her level, well, at any level. “Let me. I’ll persuade him to have a little snack and we can go over this.” Gemma patted the black binder. Her grandmother’s sad look nearly undid Gemma. “Worse, in fact. If only we had a miracle, you know, a Valentine’s miracle.” She winked at the connection to their name and the holiday. “No, but I do, honey.” There was a gleam in her eyes now. “You’ll have to believe for both of us.” It was the only way Gemma could soften the upcoming blow being dealt to her grandmother. “Gramps, on my way! Watch out, she’s plotting something.” Gemma grabbed both cookies and raced to the back of the store, much like she’d done thousands of times before when her grandmother decided on some scheme or another. She thought she’d escaped strange ideas, but Gemma came upon her grandfather eyeing the ladder. Her heart skipped a beat or two. “Don’t even think about it, Gramps. A trip to Doc’s is not on my schedule.” I couldn’t stand it if anything happened to you. Yep, that little speck of guilt grew. She was hurting both. Why hadn’t she studied history or art history or business something or other that would benefit keeping the antique store going? But she hadn’t. She’d realized early on she didn’t have the knack for selling things. Books and everything about them captivated her attention. Every chance she could get, she’d read and got lost in the story, so much so she’d block out most everything else. She’d longed to live those stories by roaming the world, but she’d buried those fanciful dreams away when real life took hold and shook her until there was nothing left but practicality. Facts were important, too. The fact that her grandparents’ livelihood wasn’t sustaining them any longer came to light several months ago. Gemma stepped in then, going over the books, the sales, the buying trips, and nothing added up to a profit. Presented with the cold hard numbers, her family relented. With their collective input, they decided on the day—their special one—to end with a bang. Now, Gemma realized as she gazed at her grandfather’s sad expression, it was going out on a whimper. He chuckled as she handed over the cookies. “I’ll attack from above.” She gazed up, seeing the dusty cardboard boxes all along the top shelf. What could possibly be worth keeping in them after all these years? Did you know that Dear Cupid and many titles are available digitally from Tule's own bookstore? Check it out!